St. Barth Restaurants – Even More Choices – It Just Keeps on getting better! 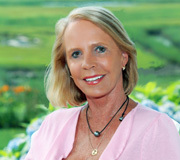 To continue my blog about gathering information for our revised Live Your Dream® magazine, Connie and I went about our business. Yes, it was a working trip and always fun. We met with people regarding the revision of some of the articles we had written. For example, the Coral Restoration St. Barth project has been drastically changed by Irma. We are hoping to bring the association’s effort to the public’s attention because St. Barth must preserve and restore what makes it so special. The Coral Restoration St. Barth’s undertaking really needs funds, or they cannot continue. I just made a personal donation and I hope you will, too. 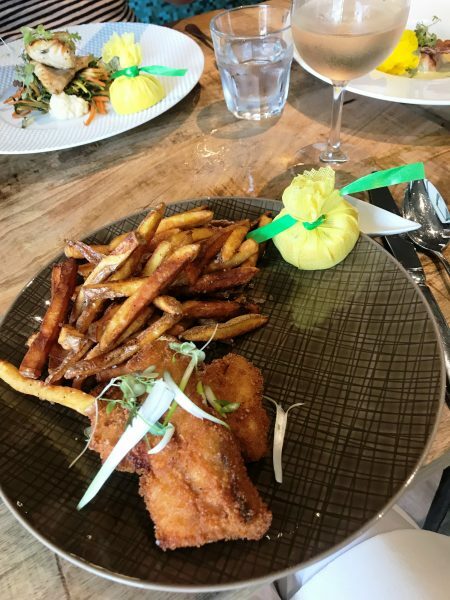 A big part of the St. Barth Experience concerns the outstanding variety of places to dine on St. Barth – from casual to gourmet. I need to be up-to-date on the latest restaurant news because people are always asking us to give them recommendations. It’s another very pleasant part of my job. Many of you know that the Gloriette restaurant on Grand Cul de Sac Beach was badly damaged by Hurricane Irma. Owner Albert Balayn is uncertain of its future but built a new place almost directly across the street from my offices. (The staff pops over there almost daily to get lunch-to-go.) Café Gloriette just opened and is run by Albert’s daughter, Sandra who prepares freshly made dishes and drinks daily. Connie and I tasted numerous selections, including the Salade Crudité, the Quiche Chèvre, the Tortilla and the Cake Salé Chèvre. – Delicious. 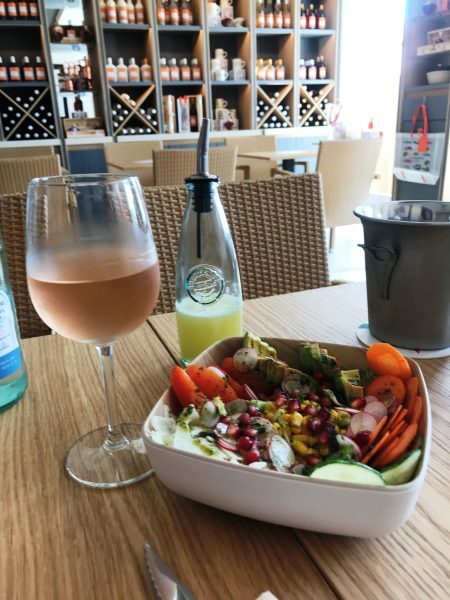 Salade Crudité dressed with fresh lemon juice at Café Gloriette is a must. Café Gloriette is open everyday except Sunday. 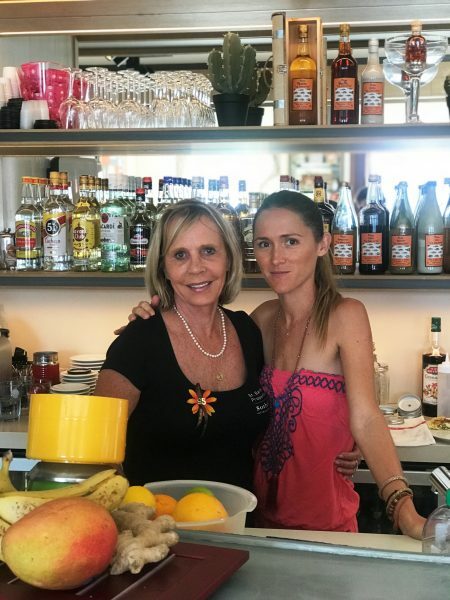 We also enjoyed a different food experience: The St Barth staff joined Connie and me at the beautiful and luxurious 6 bedroom Villa Lyra that is located above Gouverneur Beach. Villa Manager Ronas Ledee cooks and serves breakfast and lunch for the villa owner and his family. You can be pampered like this too. Villa Lyra is part of our Grand Cru Collection, that includes extra services such as continental breakfast. As a bonus, Ronas is also available to prepare light lunches for 6-12 people (buffet-style) with 2 appetizers, 2 main courses with veggies, and 2 desserts. The cost is only 300 euros for her service (shopping and cooking) per lunch (clients pay for the food and beverages). We wanted to try her cuisine before you do. We began with a glass of chilled rosé wine with ice, which I was told by my French colleagues is called Rosé Piscine. The buffet included tomatoes with mozzarella, salad with balsamic dressing; breaded chicken cutlets, beef medallions with bacon, rice and fresh broccoli. The desserts were an incredible Tarte Tatin as well as a serving of ice cream. If you would like to enjoy your St. Barth vacation at Villa Lyra, we are offering an introductory special reflecting a 10% reduction for any reservation that occurs between June 26 and November 15, 2018. Please contact reservations@stbarth.com. 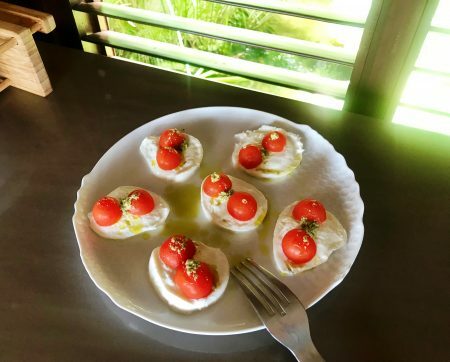 The tomato and mozzarella appetizer prepared by Ronas at Villa Lyra was light and fresh. 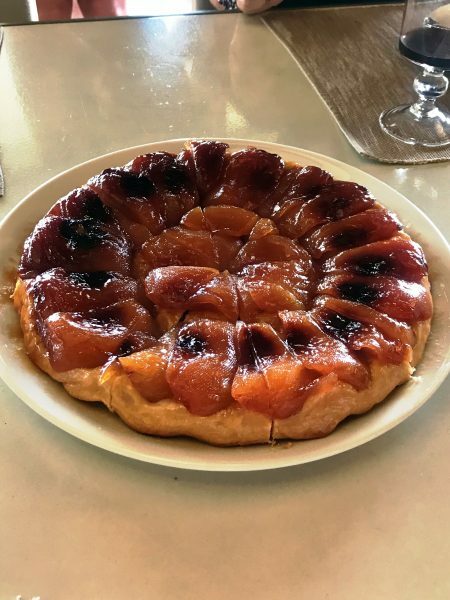 We finished our lunch at Villa Lyra by devouring Ronas’ delicious Tarte Tatin. Speaking of lunch, Connie heard us raving about the new fishCorner restaurant, so she wanted to try it for herself. She was not disappointed! We wrote about it in our April 2018 newsletter, Le Bulletin. In case you missed it: Love fish? 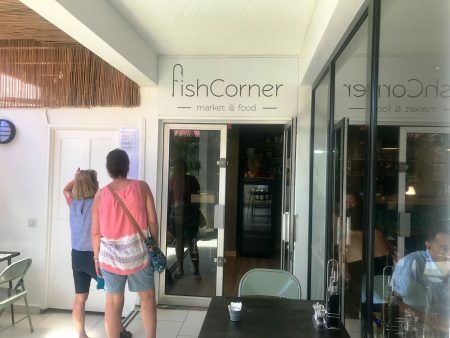 Then we have just the restaurant for you: fishCorner. 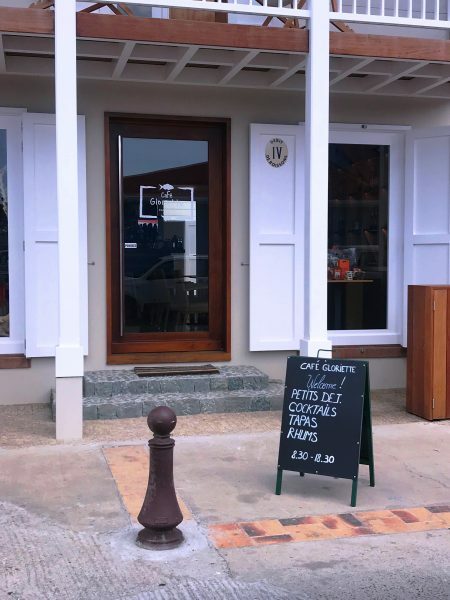 Johny Laplace, who comes from a long line of island fishermen, partnered with Nicolas Almeda (whose dad is co-owner of Black Ginger) and turned the former Stephane & Bernard Boutique into a fish market that transforms into a restaurant at lunchtime. Fish is sold from 8:00 a.m. till noon, and then again from 3:30 p.m. until 6:00. Lunch is served from noon until 3:30 p.m. every day – fresh fish, of course, and you’ll love the homemade sides. It’s so popular you’ll need to reserve your table, and we’ll be happy to do that for you. You’ll find fishCorner in the alleyway by Bar de L’Oubli. It’s open every day but Sunday. The fish and chips at fishCorner is light and tasty (Warning- Don’t ask for ketchup!) Connie’s delicious local sole is in the background. 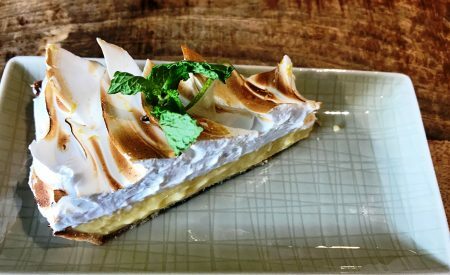 The famous lemon tart at fishCorenr cannot be duplicated. For the last two nights of our stay, we moved to the newly named Pearl Beach hotel, formerly known as Tom Beach. We each had a balcony room upstairs. The view from my room #10 was beautiful with tall palm trees, lush gardens and a glimpse of the sea beyond. There was a minibar and a table with 2 chairs on the deck to enjoy an apéritif. Connie’s room #12 had a deck with a table and 2 chairs, plus 2 lounge chairs for sunning. Each morning, we enjoyed breakfast at their beachside restaurant which is open for lunch every day. It is also open on Friday and Saturday nights, so we dined there on Friday while listening to the sound of the waves. My view from Room 10 at Pearl Beach hotel was gorgeous. 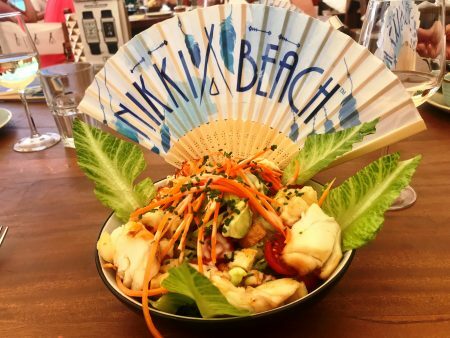 To finish off the week, we enjoyed lunch at Nikki Beach. If you have not done so, try it on a non-Sunday. It is a great, more relaxing experience. The Salade de Langouste is one of my Nikki Beach favorites. Hope to see you on St. Barth! 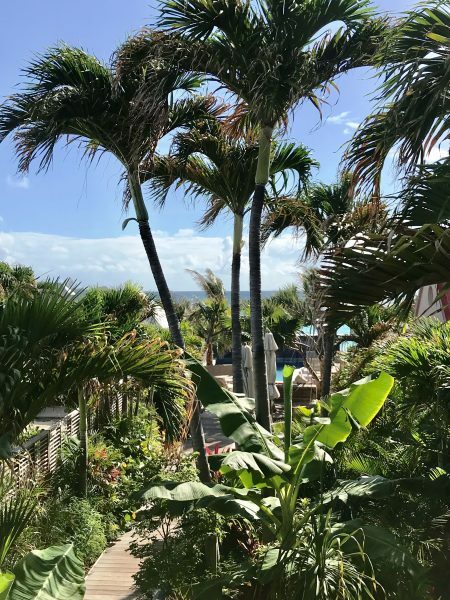 This entry was posted on Monday, June 25th, 2018 at 11:01 am	and is filed under Hotels, St. Barth Restaurants, St. Barth Trips. You can follow any responses to this entry through the RSS 2.0 feed. You can leave a response, or trackback from your own site. Will Emeraude Plage be open again later this year? Hi Elisabeth and David, I am sorry to say the the Emeraude Plage will not reopen later this year. Its future is uncertain at this point.